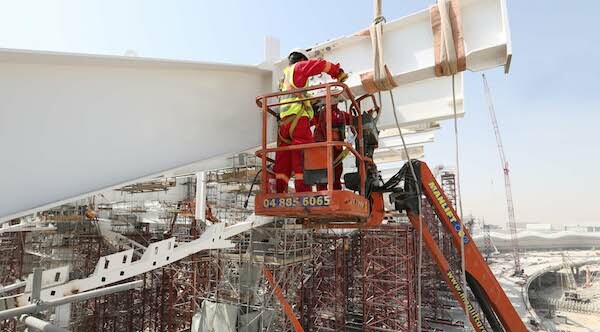 Abu Dhabi Airports announced that the steel structure of the new Midfield Terminal Building (MTB) central processor roof is now complete following the installation of the last piece of metal in the roof of the iconic building. The MTB roof span is 319m at the widest point with 18 arches, the largest of which is 180m wide and 52m high. With the main steel structure of the central processor roof now finished, the next major milestone will be the de-propping of the final arch in the central processor. Work is also progressing on the closure of the building envelope and fit-out of the four piers. Sulaiman Al Siksek, Chief Programs Officer at Abu Dhabi Airports said, “We are delighted to have achieved this milestone, as we can now move forward with the closure of the central processor area by completing all de-propping works for the roof by the end of this month. Once the overall structural work and the closure of the building envelope are complete we will hand over the internal space to our concessionaires so that they can commence fit-out of their exceptional retail concepts. Once complete, the MTB, along with the existing terminals at Abu Dhabi International Airport (AUH), will serve the increasing number of passengers who fly through the UAE capital each year – a number expected to surpass 45 million within the next ten years. In 2015, a record 23.3 million passengers used AUH as their origin, destination, or transit point. The MTB will be the largest architectural structure in the Emirate of Abu Dhabi, visible from more than 1.5 km away. The spectacular new terminal is situated between the two runways at AUH, providing the shortest possible journey from runway to parking stand and allowing a quicker and smoother experience for passengers.